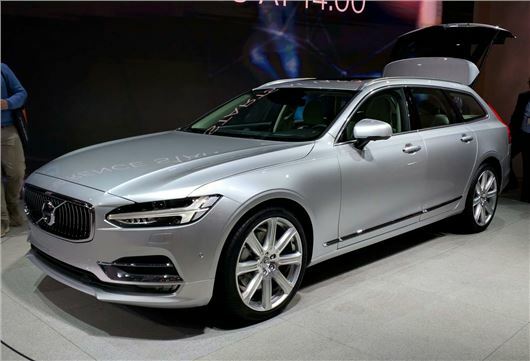 The Volvo V90 estate has been revealed at the Geneva Motor Show 2016. The new V90 will rival the Mercedes-Benz E-Class estate and boast a maximum of 1526 litres of boot space. It will cost £33,000 when it reaches UK showrooms in late 2016. The Volvo V90 estate is powered by the same engines as the S90 with the entry-level being the impressive D4 with 190PS and official economy of 62.8mpg. The D5 will return 225PS, yet still return a claimed 57.6mpg. Both come with an eight-speed automatic gearbox as standard. Like the XC90 and S90, there will also be a 407PS T8 hybrid model, with a 25 mile electric-only range. Officially the plug-in model will return 135mpg and 47g/km CO2. It will also cover 0-62mph in just 5.2 seconds. The interior will mirror the XC90, with a minimalist dashboard and large nine-inch touchscreen display located in the centre of the dashboard. Maximum boot space is 1526 litres, although this is actually less than the competition from BMW and Audi. In fact it's even less than the V70 it effectively replaces. The rear seats do fold flat though plus there's an underfloor storage area. There will be two trim levels in the UK, Momentum and Inscription, while standard equipment will include LED lights, leather seats and navigation. ﻿The lack of outright space might disappoint fans of traditional big Volvo estate cars, but they're sure to be impressed by the good looks of the V90 both inside and out.